Broker reports are one of the most widely-used information sources for equity investors of all stripes, and there is no doubt they can be a very useful source of background information on an industry or company. In addition, they provide financial forecasts, valuation estimates and, of course, the analyst’s overall conclusion: buy, sell or hold. But how should you think about using this information in forming your investment decisions? It would be tempting to think that a professional broking analyst who closely follows a company should be able to provide an authoritative investment view in relation to that company, but is it as simple as that? One way to shed some light on this question is to analyse the historical evidence. We live in an age of abundant data, and it is not hard to gather a history of broker recommendations, and look at how those recommendations have fared in a statistical sense. A simple place to start is with a metric called the “Recommendation consensus”. This is a statistic that is calculated by converting every analyst’s recommendation on a stock into a number from 1 to 5 (where a “strong sell” is 1 and a “strong buy” is 5), and averaging across all analysts who cover the stock. This gives us a single figure which, in theory, should tell us something about whether a stock is a good investment candidate. 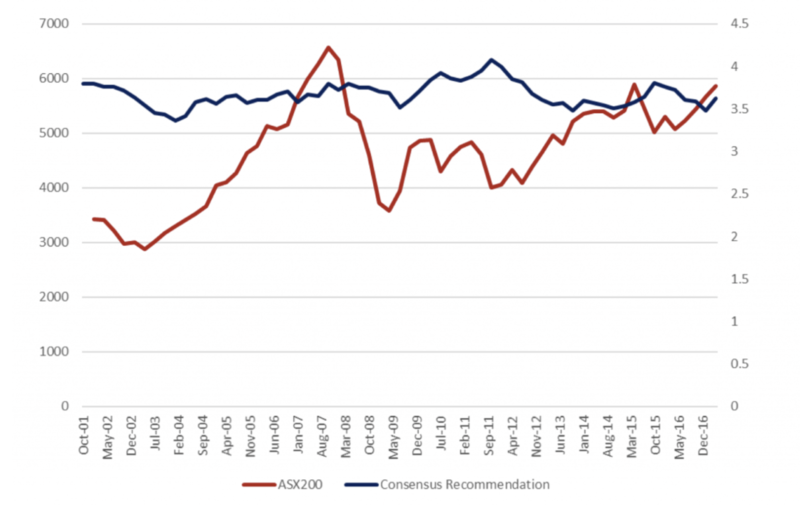 Recently, we assembled recommendation consensus data for a broad sample of ASX-listed companies stretching back over 15 years. The results were interesting. The first things that jumps out from the chart is its asymmetry. There are very few observations between 1 and 2, and not many between 2 and 3. The distribution is concentrated between 3 and 5, meaning there are a lot of “buy” and not so many “sell” recommendations. This will come as no surprise to many people. Brokers have clear incentives to stay on good terms with the companies they cover (for example to maintain access to management, or to be in a position to pitch for capital raising roles), and so a reluctance to make a “sell” call is understandable. However, it serves as a reminder that when looking at any form of advice you need to be mindful of how it may be shaped by the adviser’s incentives. Next, we can look at how the consensus recommendation has changed over time. In the last 15 years, we have seen a wide range of equity market conditions, including a period of attractive valuations at the bottom of the Global Financial Crisis (GFC), and more recently a period of more expensive valuations. In an ideal world, broker recommendations would all be singing “buy” when markets are cheap, and “sell” when they are expensive. However, as the chart below indicates, this dynamic is subtle at best, with the average recommendation consensus staying within a fairly tight range. Once again, we need to think of this in the context of broker incentives, both at the level of the broking house (who may wish to encourage investors to trade between stocks, rather than exit the market when prices are high), and the individual analyst, who may need to manage career risk by making relative, rather than absolute, recommendations. This brings us to the interesting bit: Do companies with a recommendation closer to 5 make significantly better investments than companies with a recommendation closer to 1? To address this, we split the data into two groups: one containing all the companies with a higher-than-average consensus recommendation, and one containing all the companies with a lower-than-average recommendation. We do this analysis on a risk-adjusted basis, which means that we adjust for the beta of individual companies when looking at outperformance. In a market that goes up strongly, high beta companies will naturally do well (and vice versa), and we risk-adjust to remove this effect from the analysis. As you can see, the first seven or eight years of our sample period saw the higher-recommendation companies delivering better investment performance than the lower-recommendation companies. However, the reverse has been true in more recent years, and the two portfolios end up with pretty-much identical risk adjusted returns over the full period. It is not obvious to me why this should be the case. One could argue that the industry pressures faced by the broking industry in recent years have led to a loss of experienced talent and a reduction in the quality of sell-side research, but there are other hypotheses that could also be put forward to explain the change in performance. 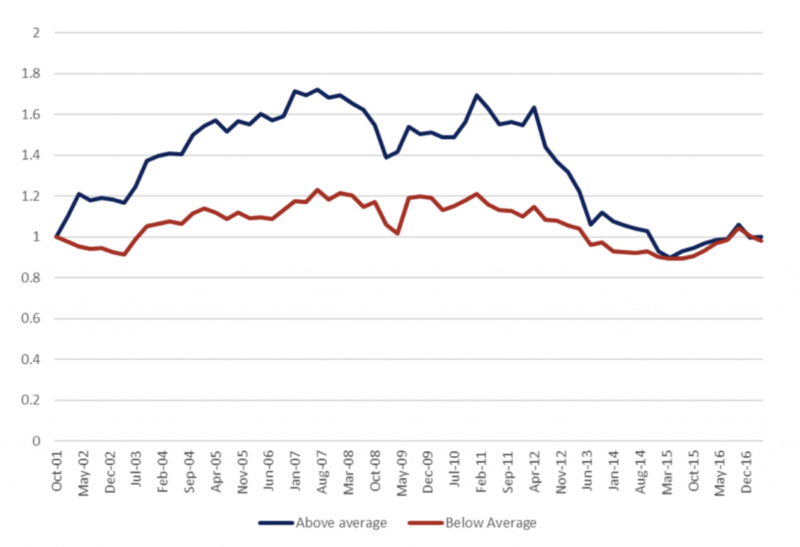 Interestingly, the peak of outperformance for the “Above average” portfolio pretty much coincided with the start of the GFC. While we can’t definitively explain the pattern above, we can conclude that simply basing investment decisions on the recommendation consensus does not look like a very powerful investment strategy to be following today. This is not to say that broker research is without value. It continues to provide a good source of industry and company information, and a measure of what near term earnings the market might be expecting from a business. Also, it seems likely that the very best analysts should offer greater insight than a consensus measure that reflects the views of all analysts. As is often the case, genuine investment edge proves to be an elusive beast, and to extract real value from broker research, investors need to do some homework. In my view, a reader who understands the author and their motivations, and who thinks critically about the information provided, can extract considerable value from a good piece of broker research. Thanks for sharing Tim, some interesting analysis and a balanced view. The short message seems to be, don't trust a broker to give advice that's in your best interests. Excellent article and reinforces my feelings on broker reports. Why they continue to use EV/EBITDA rather than EV/EBIT is beyond me. the most obvious and widely accepted explanation is that the markets are relatively efficient. whilst some individuals may outperform from time to time, over the longer term, the sum of the analysis is useless. that is why index funds are popular. A nice piece Tim the additional factor for the high correlation of returns from both good and less good broker recommendations might be the current very high percentage of earnings that come from corporate issuance. There is a fair amount of information for this from the brokers lodged annual returns. I once had an advisor, who gave me little (twice don't buy) investment advice, was very amicable, talked about golf and other social matters over a couple of beers. Strangely he believed that I got good value from him when I asked ($1500 for 6months) even though we had 'shout for shout' - maybe I judged him too harshly?? Or is this the norm?? Great article - balanced and rational. I wonder if the similarity of performance results is due to a premium for out performance already being priced in to the recommended stocks and similarly price penalty already applied to out-of-favour (sell recommended) stocks. The analysts and brokers don't seem to be first movers but often make their buy or sell recommendations after the market and price has already reacted and moved a little. Also retail investors see the recommendations later in the process after major funds have already made their move. Perhaps when that premium reverts thereby lowering that element in the share price and also when the penalty reverts increasing that element in the share price - could explain some of the convergence of performance.